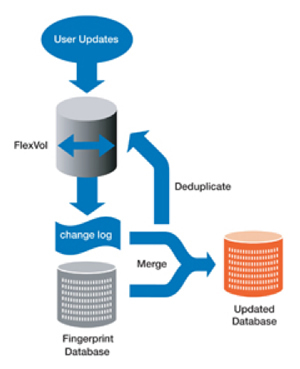 NetApp deduplication is an integral part of the NetApp Data ONTAP® operating environment and the WAFL® file system, which manages all data on NetApp storage systems. Deduplication works "behind the scenes," regardless of what applications you run or how you access data, and its overhead is low. A common question is, "How much space can you save?" We'll come back to this question in more detail later, but, in general, it depends on the dataset and the amount of duplication it contains. As an example, the value of NetApp deduplication in a mixed environment with both business and engineering data is illustrated by Atlanta-based Polysius Corporation, which designs and enhances new and existing cement plants. 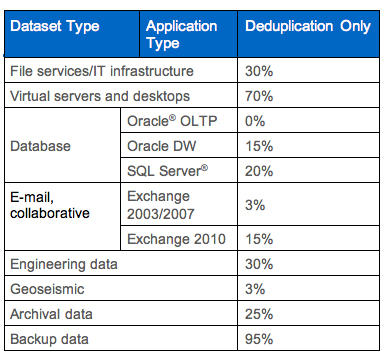 At its heart, NetApp deduplication relies on the time-honored computer science technique of reference counting. Previously, Data ONTAP kept track only of whether a block was free or in use. With deduplication, it also keeps track of how many uses there are. Using deduplication, a single block can be referenced up to 255 times for both NAS and SAN configurations. Files don't "know" that they are using shared blocks—bookkeeping within WAFL takes care of the details invisibly. How does Data ONTAP decide that two blocks can be shared? The answer is that, for each block, it computes a "fingerprint," which is a hash of the block's data. Two blocks that have the same fingerprint are candidates for sharing. When NetApp deduplication is enabled, it computes a database of fingerprints for all of the in-use blocks in the volume (a process known as "gathering"). Once this initial setup is finished, the data is ready for deduplication. NetApp uses this checksum as the basis for the fingerprint. Since we were going to compute it anyway, we get it "for free"—there is no additional load on the system. And since WAFL never overwrites a block of data that is in use, fingerprints remain valid until a block gets freed. The tight integration of NetApp deduplication with WAFL also means that change logging is an efficient operation. The upshot is that deduplication can be used with a wide range of workloads, not just for backups, as has been the case with other deduplication implementations. If you have 100 VMs running the same OS and each virtual machine requires 10GB to 20GB of storage, that's 1TB to 2TB of storage dedicated to almost identical copies. Applying NetApp deduplication can eliminate much of the inherent redundancy. Teamcenter utilizes a relatively small metadata database combined with a large "vault," where engineering design files are stored. Every time an engineer saves a design within Teamcenter, a complete copy of that design file is saved in the vault, even if the change made to the design is minor. Similar to Teamcenter, IBM Rational ClearCase—a leading software configuration management solution—consists of a metadata database in combination with a large "versioned object base," or VOB, in which files are stored. Deduplication is most useful with ClearCase in situations in which a copy of a VOB needs to be made. In addition, preliminary results in a laboratory environment suggest space savings of 40% or more using deduplication in a ClearCase environment when whole files are stored. Deduplication consumes system resources and can alter the data layout on disk. Due to the application's I/O pattern and the effect of deduplication on the data layout, the read and write I/O performance can change. The space savings and the performance impact depend on the application and the data contents. For deduplication to run properly, you need to leave some free space for the deduplication metadata. 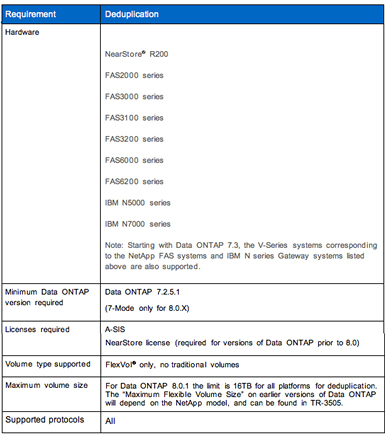 For Data ONTAP versions prior to 7.3, each flexible volume should have 6% of the total data's worth of free space. For Data ONTAP versions 7.3 or later, the aggregate should have 4% (fingerprint + change logs) of the total data's worth of free space for all deduplicated flexible volumes, and each flexible volume should have 2% of the total data's worth of free space. This is described in more detail in TR-3505, section 5.3.3. Carlos has been working with NetApp since 2008, specializing in storage efficiency with deep-dive expertise in deduplication, data compression, and thin provisioning. He regularly provides guidance for integrating the most effective and appropriate NetApp® storage efficiency technologies into customer configurations. With over 20 years of industry experience, Carlos has been called on to create numerous implementation guides, technical white papers, reference architectures, best practices, and solutions guides. The first Back to Basics article focused on NetApp® thin provisioning. Check out the article to learn how it's implemented, best practices, and more. Could you please guide me that how to findout a acual used space of a volume in the case of deduplicaion enabled.